One approach to managing invasive species is to manipulate or restore biotic interactions to promote natural population control. Understating how altered interactions drive "invasion success" (increased demographic success in an invaded range) or "biotic resistance" (communities providing resistance to invaders) provides the theoretical underpinnings for management practices designed to enhance the biotic resistance of communities. We incorporate theories from ecology & evolution to better help uncover causes of invasion success or biotic resistance and to provide insight into optimal management solutions for controlling invaders via natural population control. We also examine the ecological outcomes of invasive species management programs. One motivation for managing invasive species is to alleviate their impacts on ecological systems and to promote ecological recovery. 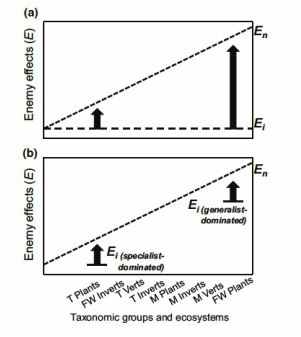 However, management can have direct (via nontarget effects) or indirect effects (via altered ecological interactions) on ecological systems. We have created a database of ecological outcomes of invasive species management to examine how often and in what contexts removing invasive species leads to an ecological gain. We are using this database to make management recommendations for when additional or alternative management to the removal of an invader population is needed to benefit ecological systems. We collaborate with Jiri Hulcr and Damian Adams (SFRC, University of Florida), and Kier Klepzig (USDA Forest Service) on this research. 2015: Prior KM, Powell THQ, Joseph A, Hellmann JJ. Insights from community ecology into the role of enemy release in causing invasion success: the importance of native enemy effects. Biological Invasions 17:1283-1297. 2014: Prior KM, Hellmann JJ. Does enemy release contribute to the success of invasive species? A review of the enemy release hypothesis. In R. P. Keller, M. W. Cadotte, and G. Sandiford, editors: Invasive Species in a Globalized World: Ecological, Social, and Legal Perspectives on Policy. University of Chicago Press. pp. 252 (peer-reviewed book chapter). From Prior et al. 2015, we suggest that we shouldn't expect a leading hypothesis of invasion success the "enemy release hypothesis" (that is the foundation of biological control) to be equally likely for different types of invasive species. This is because the likelihood of enemy release is partially contingent on the strength of top-down control, in which trophic theory predicts is not equal across trophic levels or ecosystems.